It's a new feature to guide new users, of course, all current users can get the rewards from it as well! 1. Voyage Quests are unlocked at Castle Lv4, and will only be available for 14 days. 2. Complete each quest to get rewards. After you finish all Voyage Quests, you can get the Completion Reward. Please follow this voyage to grow stronger and get rewards! Tap on the button on the left side of your map (displayed in the picture on the below) to enter the Voyage Quest challenge. *The Avatar at the left top of your view contains a number at the left bottom, this is your Player Level. The ways you can gain player exp are: Monster Hunting, Forging Equipment, Completing guild or admin quests, Completing or sweeping hero stages and more. Check Fastest Way to Reach Level 60 to know more. 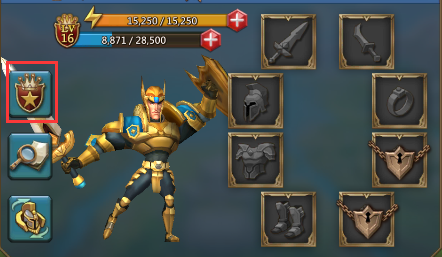 *Click your Avatar, and then tap on the button on the left side(displayed in the picture on the below) Talent points are spent in the hero skill tree and significantly increase your economic and combat boosts. *In Lords Mobile Might is everything. Whilst Might may not directly benefit you as a player, indirectly it shows other players how far advanced you are in the game and how strong of an opponent you are likely to be. The different types you can earn of Might are: Buildings, Research, Player level, Quests, Troops and traps, and Expanding your Turf. *The Castle is your most important building. Upgrade to unlock new buildings and features, gain might, increase the max level of other buildings, and number of Soldiers you can add to your army. *Monster Hunt is an extra which allows you to attack monsters found on the World Map. You must be in a Guild to hunt monsters. *Hero stages is a segment of the game where you get better heroes, and better gameplay. This is one part of the game where you work alone. Hero stages give out a lot of loot whenever you complete one stage. These loots can be used to improve your might, speed up constructions and research. *Lords Mobile consists of four different troops: Infantry, Siege, Ranged and Cavalry. You can train it on Barracks. *Skirmish 4: Lush Plains is protected by Death Archer together with Black Crow and Sage of Storms. It is defensed by a 225 Health Point wall with traps including 150 spikes, 75 archer towers, and 150 spoke boulders. 1125 troops battle to shield the plains including 30 catapults, 195 archers, and 900 cataphracts. The best way to defeat this skirmish is using ranged troops. *The building only unlocks at level 10 castle. In this building you can do hero only based PVP battles ( no troops , gears or buffs involved ). *If you're an F2P player, you can get some heroes on Hero Stage. And you also can buy some powerful heroes. What are P2W Heroes Worth Buying? this guide is targeted at the player who is wondering which heroes are worth to buy. Complete all voyage Quests and claim theire rewards to get the Completion Reward! *Quest rewards can still be claimed when the Voyage Quest ends. Previous Previous post: Lords Mobile Special Event: A New Eggventure!